Heat shrinkable cable end cap in X-linked polyolefin with adhesive coating suitable for power or telephone cable end sealing. In addition to Heat Shrinkable Cable Sealing Cap and Breakouts, our range of Heat Shrink Right Angle Boots and Straight Boots provide insulation to the bushings in the cable termination box, where the clearance between phase to phase and phase to earth is less than the normal air clearance. We Cabseal as Heat Shrinkable Cable Sealing Cap Manufacturers India, built up our activities in the year 1994, as one of the praised dealers, exporters, providers and wholesalers of an expanded scope of Industrial Electronic Motors. Cabseal achieved its goals with in house well-equipped test lab and continuous testing of products at Internationally acclaimed & acknowledged Central Power Research Institute India. Cabseal offers Sealing Caps are made from high quality cross linked polyolefin material that offers exceptional non tracking behavior, insulation and long term service reliability for indoor and outdoor applications. The creepage extension sheds are internally coated with water resistant mastic. Our firm is actively involved in supplying a qualitative assortment of Heat Shrinkable Sealing Caps. The offered range of Sealing Caps is suitable for the protection of cable joints and terminations in low voltage power applications. Besides, they are designed with the use of premium quality material and advanced technology under the vigilance of cabseal professionals. 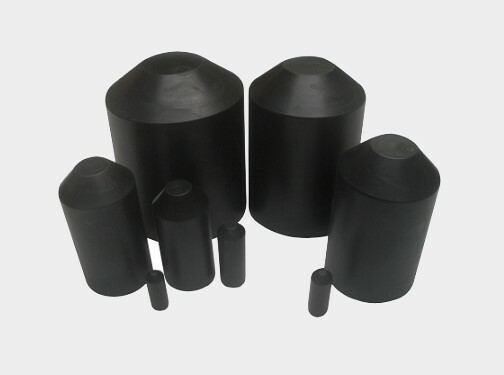 These Sealing Caps are highly acclaimed in the market owing to features like durability and high quality. They are available with us in a number of sizes at an affordable price.